Large games room with one full size snooker table, pool table, table tennis table and table football table. Archery participants will learn basic archery skills on our indoor or outdoor range which will demand mental focus, hand eye coordination and instructors will introduce a competitive element. The Assault Course provides a great physical fitness and team building challenge in a controlled and fun environment. The assault course is an excellent all-round form of physical exercise which requires both mental and physical prowess to overcome the obstacles and develop a sense of team work where participants also learn to evaluate and overcome problems and boost their confidence and increase their fitness levels. Obstacle courses can be of great benefit for children providing a fun way of exercising and also for children with disabilities like autism where it has been proven that obstacle courses can build gross motor skills while developing important processing skills. Camp craft participants will learn basic outdoor survival skills building a shelter, starting a fire, how to find clean water, outdoor cooking etc. Campfire – this is a great way to unwind after a full day of activities. This evening session is a great way to relax and enjoy some quality time together whilst they toast marshmallows drink hot chocolate, sing songs, play games gathered around our campfire and be entertained by Normans ghost stories! Canoeing and kayaking participants will get a fun introduction into paddle sports learning basic paddling techniques in a variety of craft, and for more adventurous and experienced participants take a sea safari around Strangford Lough. Caving Will provide a unique activity to participants. Caving is a sport involving the exploration of natural or man- made caverns. Participants will walk, crawl and swim through a subterranean world of tunnels, caverns, waterfalls, rivers and sumps exploring rock formations and attempt the physical and mental challenges presented. Jacobs Ladder participants must climb up a giant high ropes ladder of horizontally suspended logs, the challenge comes with the ever-increasing gaps between the rungs. Participants have to effectively communicate with each other, discuss their options, and decide on how to ascend the ladder. Leap of Faith – participants climb to the top of a 10 metre pole, stand on a small platform before counting to three and putting their faith in themselves as they jump and reach to catch the mid-air suspended trapeze. A great activity where young people can safely take risks and learn from them â€“ participants are gently encouraged and supported by our qualified Instructors to push their own boundaries as far as they wish, whether that is only a few steps up the pole, half way or all the way to the top and then the leap. Crate Stacking – participants work together in teams to get their group to build the crates as high as possible by adding crates to the stack without it collapsing. The most successful team will have the highest stack. Traverse participants navigate a course consisting of climbing poles, rope wires, swinging bridges and ropes swings to complete a challenging high adrenalin course 10 metres off the ground. Great for personal development . Hill Walking is exploring the hills and countryside of the Mourne Mountains and other venues, participants will be transported to a new challenging environment challenging their physical fitness and exploring the outdoor environment and nature. The Indoor and outdoor climbing wall is a climbing activity simulating rock climbing in an indoor environment, participants will be faced with a physical and mental challenge as well as learning basic climbing skills. Our purpose-built indoor and outdoor climbing walls provide the ideal opportunity to develop co-ordination, stamina and determination, whilst learning basic climbing skills and techniques. Inflatables providing activities which young people gain lots of fun, enjoyment and physical activity from. 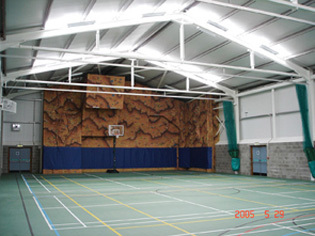 A range of bouncy castles and inflatable slides provide activities for young people from 4 years and upwards. The inflatables can be used indoors we can provide this activity all year round. We can incorporate this activity into our birthday party packages or offer it as a single activity. 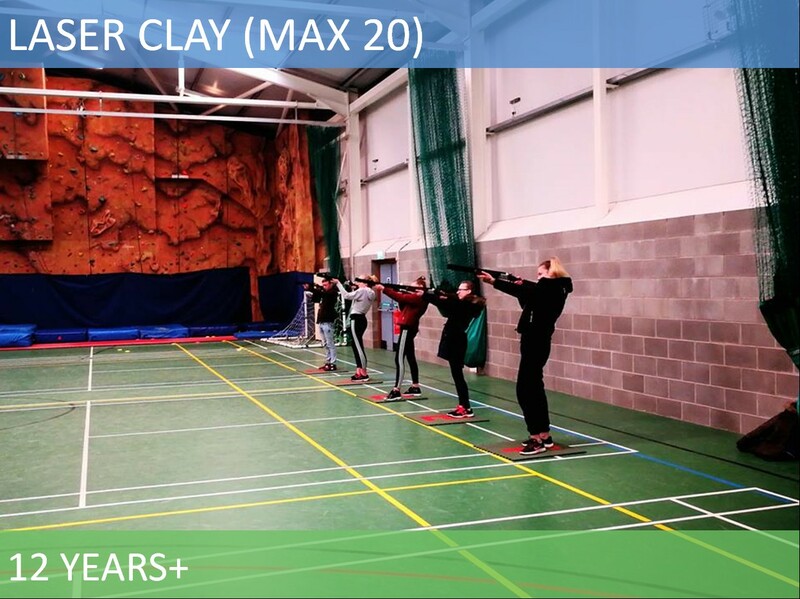 Laser Clay Pigeon is a shooting activity that simulates actual clay pigeon shooting, however with the advantage of several shooters being able to participate at the same time. The activity is easy and fun, and does not require any previous experience in shooting. It is perfect for all ages above 12 years, male and female alike. Players use actual shotguns which have been converted to fire harmless infrared light beams. These beams reflect off the clays which are physically fired into the air, and then sent to an electronic scoreboard. Sound effects of a ‘hit’ or ‘miss’, are emitted by the scoreboard. This activity is ideal for a competitive team building event as it can be made competitive by scoring each shooter, or group of shooters, separately. With different formats of game plays it is not just a try it once type of activity, it is something that groups or individuals can visit time and time again and have a different experience. The activity will be a test of the participants concentration, determination and accuracy. 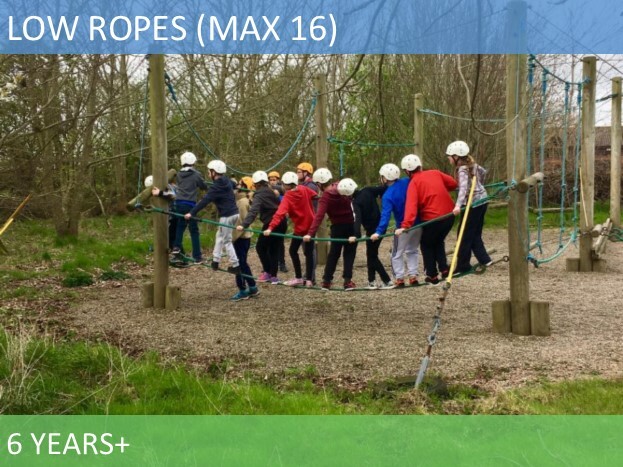 Low Ropes Course is our low ropes course encourages communication and cooperation and helps participants build confidence, developing balance and coordination as they navigate their way through a series of bridges only one metre off the ground. This course requires participants to work in small teams of three, with one participant and two ‘spotters’ as they move around each element tackling the challenges these present, navigating a series of ropes, bridges and poles and developing agility. Mountain Biking participants will learn basic bike riding skills before being challenged over obstacles and rough terrain before taking on our pump track. Mountain biking is very physically demanding and will require a good basic fitness level. In the Nightline participants follow a trail wearing a blindfold and receive instructions from instructors or fellow participants, the challenge for participants is to complete the course and challenges without removing their blindfold. This activity focuses on team building, communication and trust.. In Orienteering participants will learn navigational skills using a map and compass to navigate around a set course. Raft Building is a fun team challenge which will require participants to build a basic raft from barrels, wooden poles and rope and race against other teams. Great for team building, communication and leadership. Rock Climbing is a physical and mentally demanding activity, testing a participants strength, endurance, agility and balance along with mental control in a peaceful setting in the outdoor environment. Participants will learn climbing skills, rope skills and we will also provide an abseil. Slip n Slide and Water Wars is a fun activity for the summer months where participants will slide down our 16ft inflatable slide onto a slippery runway followed by a water fight with water bombs and water pistols, be prepared to get very wet!! Stand up paddle or SUP is a form of surfing which is inclusive for everyone from 8 years upwards and for people with disabilities. Combining a long surfboard with a paddle, the sport is a blend of surfing and canoeing where an individual stands on a surfboard whilst using the paddle to move through the water. SUPs is an excellent way of exercising combining a complete body workout incorporating balance, muscular strength and endurance, core stability and aerobic fitness into one activity. This sport is one of the fastest growing in the world and will offer new exciting challenges to participants to try this sport. We offer taster sessions to SUP tours around Strangford Lough.